Grangerland RFD - Halifax to Ingonish Ferry N.S. 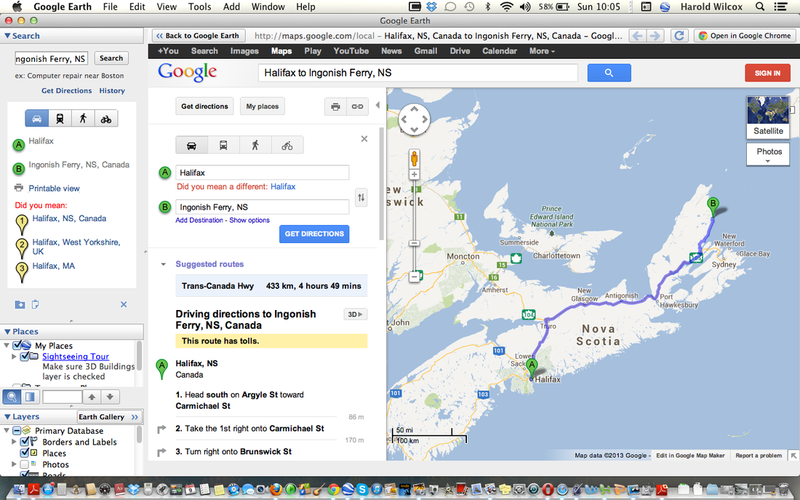 Halifax to Ingonish Ferry, N.S. It was a little hard to sleep our last night in Halifax. Some lady got drunk and tried to break into our room. She tried other rooms too and somebody called the cops. The manager was really embarrassed. I expect the lady was, even more so. We followed 105 about the whole length of Cape Breton Island. How far can Cut and Shoot and Cleveland be. About 3k miles. On the way we dropped in at a Tim Hortons. It is perfect for cookie monsters. It's not on this map but there is a Tim Hortons almost everywhere. Bras d'Or lake (Brador) cuts through most of Cape Breton. Sydney, where the Ferry from/to Newfoundland connects is just about where the plane logo is. Our destination is the Cabot trail which is the yellow line around the upraised peninsula on the map. Just before we got to the lodge we passed over Cape Smoky. Sally had seen a road going up a mountain and I said I hoped it wasn’t for us. It was. You see it as the raised portion of land just to the right of the hook in the road to the right of Ingonish Ferry. It really is raised. If you play with google earth you can get a really good view. Somebody in a Ford Ranger passed us going up that mountain. God protects fools and drunks. I don’t know which he was. Our research was done by Squishy travel. Thanks Anita! Now don't ask me why we didn't get a good picture of the outside of our cabin. We didn't, this is from google. I think we were just overwhelmed by all the beauty. Knotty Pines is owned by Howard and Kathy MacKinnon. They are very nice people. Kathy set up our WiFi after we arrived. The next morning (shivering) she turned our hot water on. We had a wonderful cabin and they had just finished the renovation. She and Sally are now friends on facebook and I hope she is reading this. We spent three days there and it was beautiful. This page is very short because it needs to be. Nothing I can say will equal the beauty of the place. The slide show is intended to be the star and will be even more so in the next installment. You will find captions where I thought some explanation was needed but it is mostly pictures. We stayed at this lodge in Ingonish Ferry for three days and drove the loop of the Cabot trail. There are a lot more pictures of the trail and, therefore, the next installment's slide show will be huge compared to this. There is a lot more eye candy to come. If you think Canada is just frozen prairie, think again. There is that but there are two coast lines that just keep going and going. Love the viist.